The following images are in approximate chronological order. 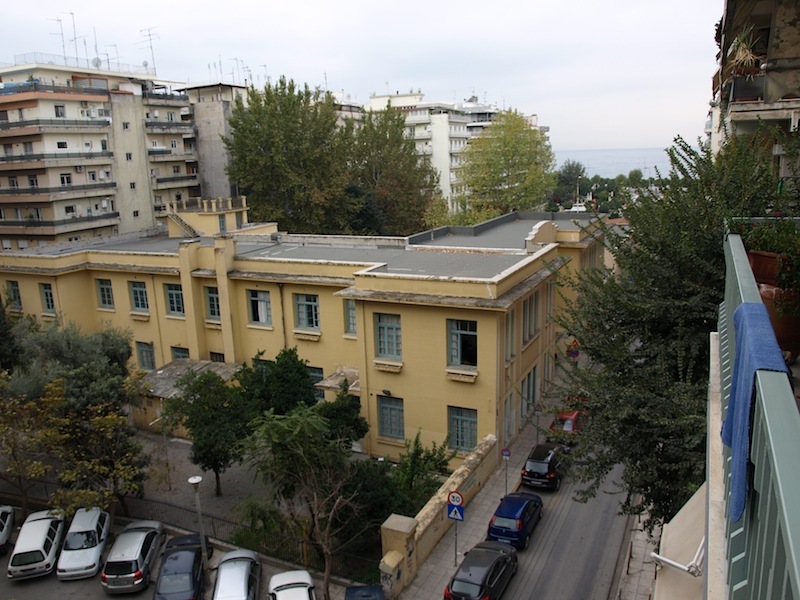 John and Litsa’s apartment is about six kilometres from the centre of Thessaloniki. There is a seaside boulevard from near where they live to the centre but we only walked it once. It was pleasant but we didn’t need to do it more than once so we caught buses to and from the city on subsequent trips. View from John and Litsa’s balcony. The lower of the buildings in this photograph is a school. The start of the six kilometre walk to the city centre. I enquired about hiring bikes but to no avail. 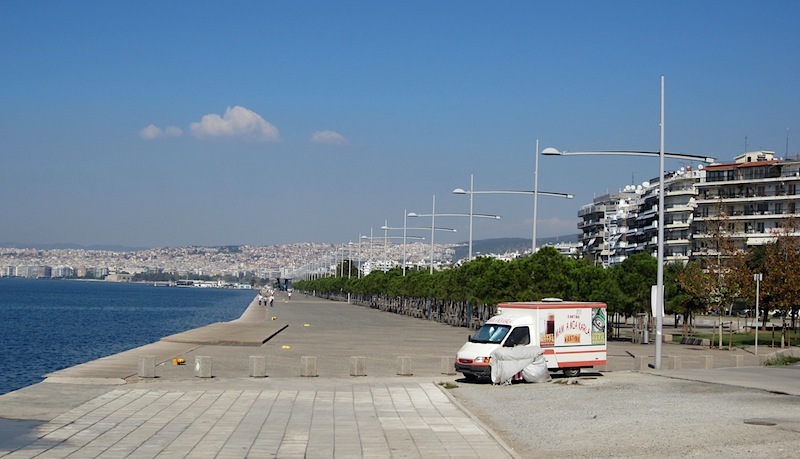 At the city end of the boulevard is one of Thessaloniki’s most historic buildings, the White Tower. 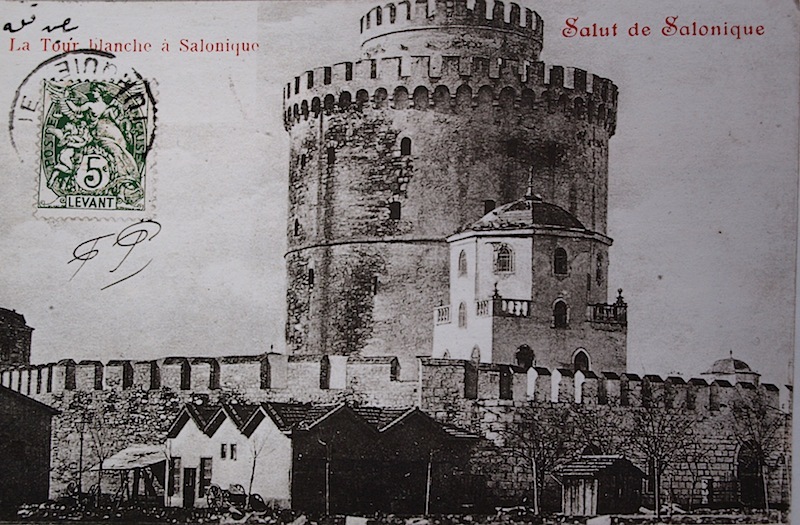 Postcard of the White Tower. The wall and smaller building has long been demolished. The White Tower was built by the Ottomans around the 1430s and has been used for many purposes including a prison and an execution facility. 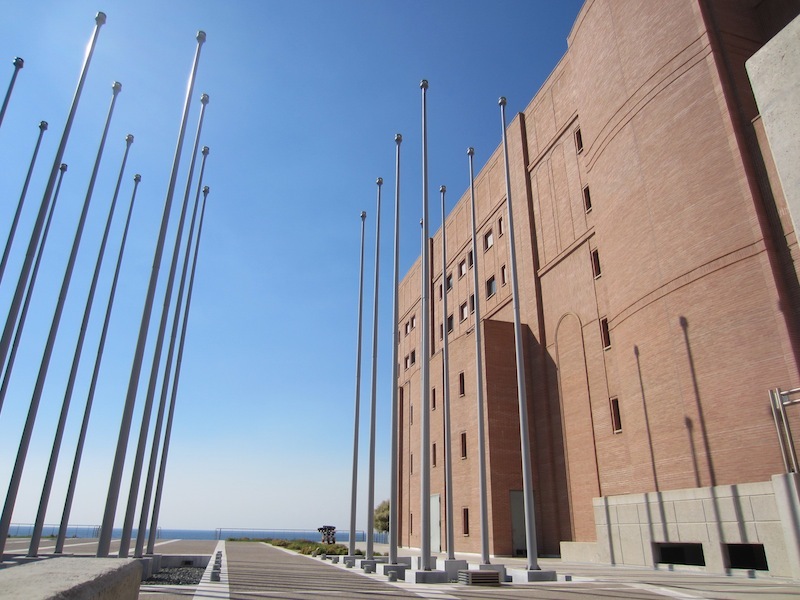 Today it is a museum and houses an exhibition depicting the evolution of Thessaloniki as a city. 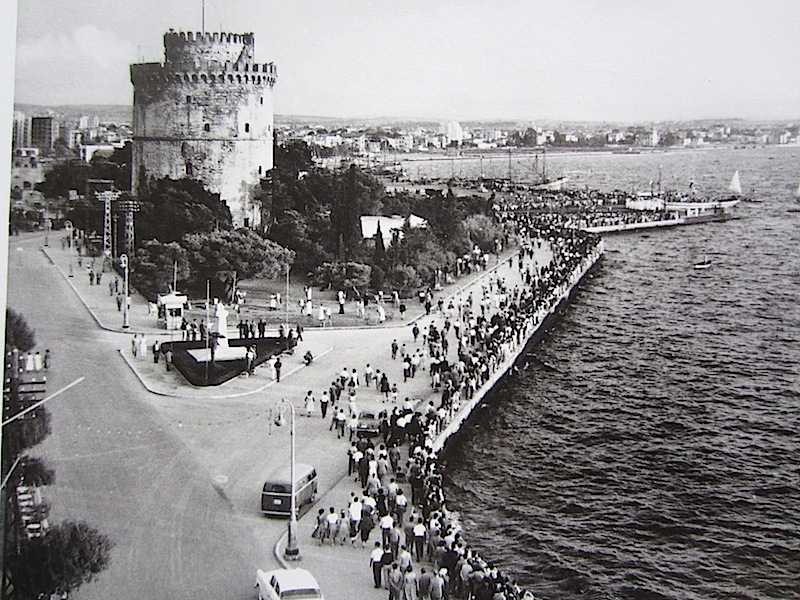 This image circa 1970 was when Bev and I were last in Thessaloniki. There were fewer cars on the roads then. In the 1970s when driving from Munich to Damascus we would sometimes drive all day and see only a few cars. 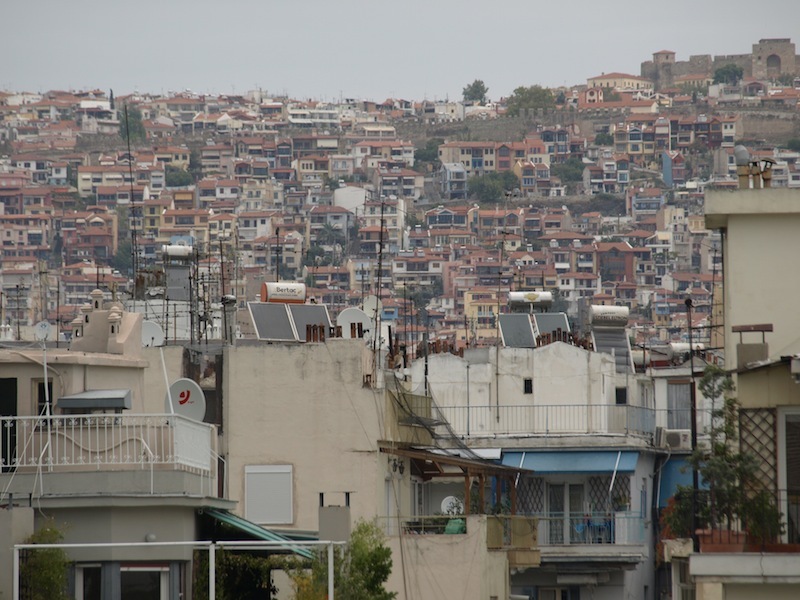 View of Thessaloniki from the top of the White Tower. A long telephoto shot which makes it look as if we are lower than the surrounding buildings. Note the castle at top right of the photograph. One night during our stay we visited the castle. 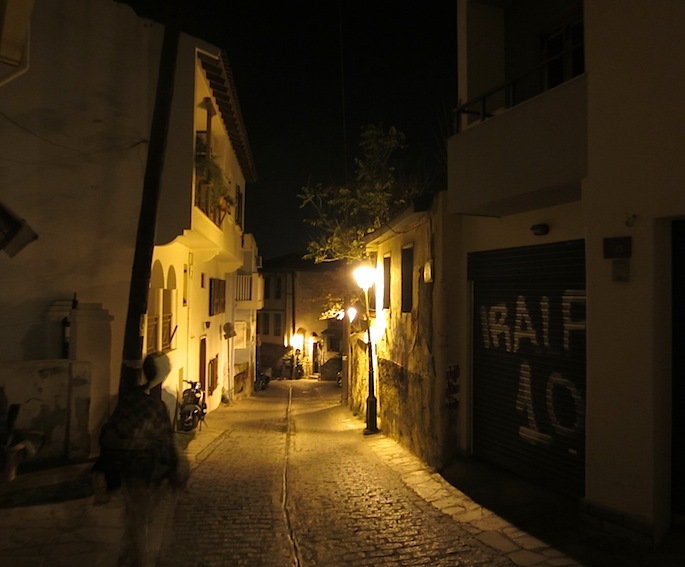 It was an amazing experience wandering the narrow cobbled laneways at night. I’ll tell you more about the walk later. Highrise living along the boulevard. Aerials bringing in the news of the world. No disrespect intended to the residents of Thessaloniki but I couldn’t see myself living in suburban Thessaloniki as after living on acreage over the past forty years I’m used to space. 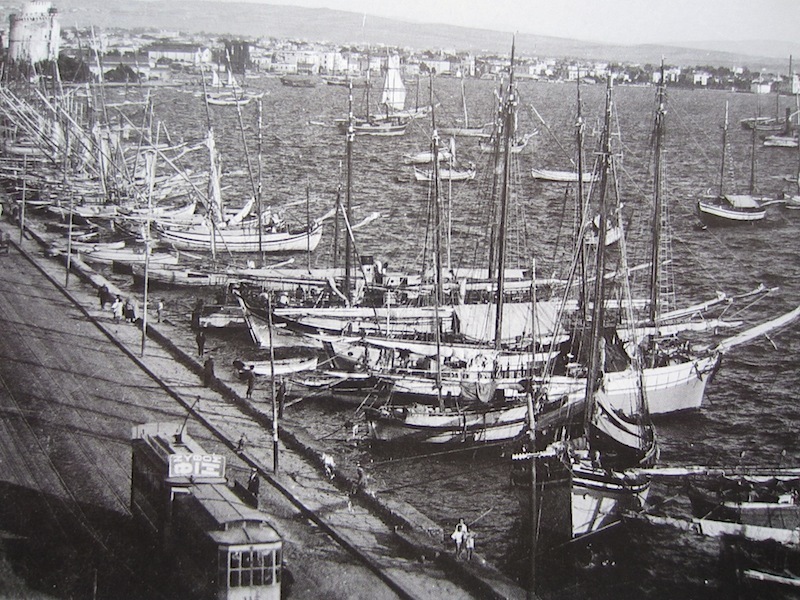 Boats along the wharf near White Tower in earlier years. There are fewer boats along the boulevard these days. In fact I saw only one and it was a small dingy. My thinking is that goods and people are less likely to be transported by sea these days. Most people now have their own transport and road improvements means goods are transported by truck. What goods are moved around the islands of Greece today is by large commercial shipping lines such as SAOS. Another postcard image along the waterfront. 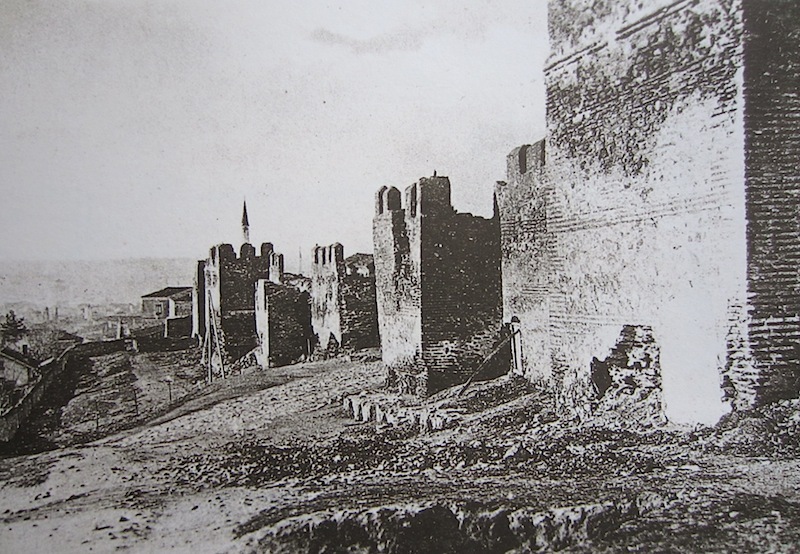 As was the case in Istanbul, it is sometimes hard to find old images of cities and towns. Once I find them I can’t help but buy them for inclusion in this blog. I love B & W images and I appreciate the effort of the photographer considering the size of the cameras and all the associated gear they had to lug around. Have you ever wondered why the subjects never smiled in portrait photographs taken years ago? It’s because the exposures were so long that they were told not to smile as it is difficult to hold a constant smile for any length of time. 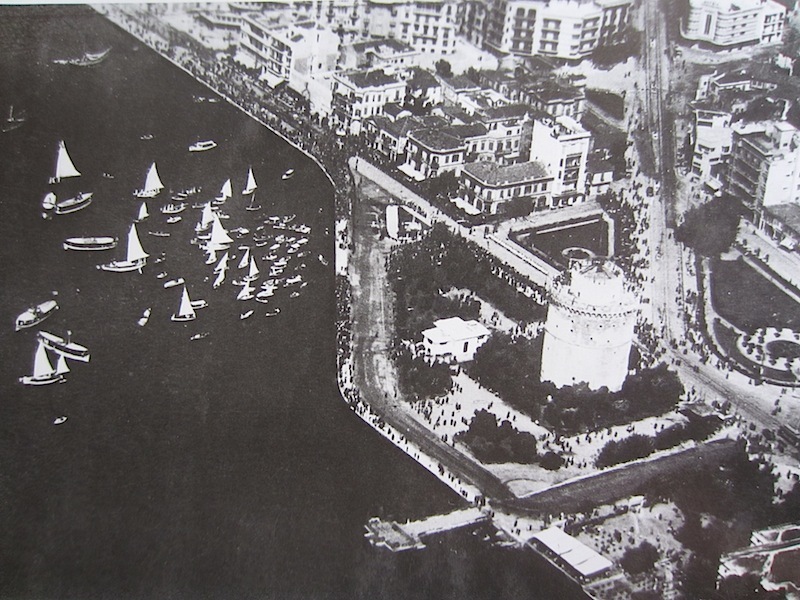 Birdseye view of the White Tower area. Notice the lack of cars; now it’s chockers! 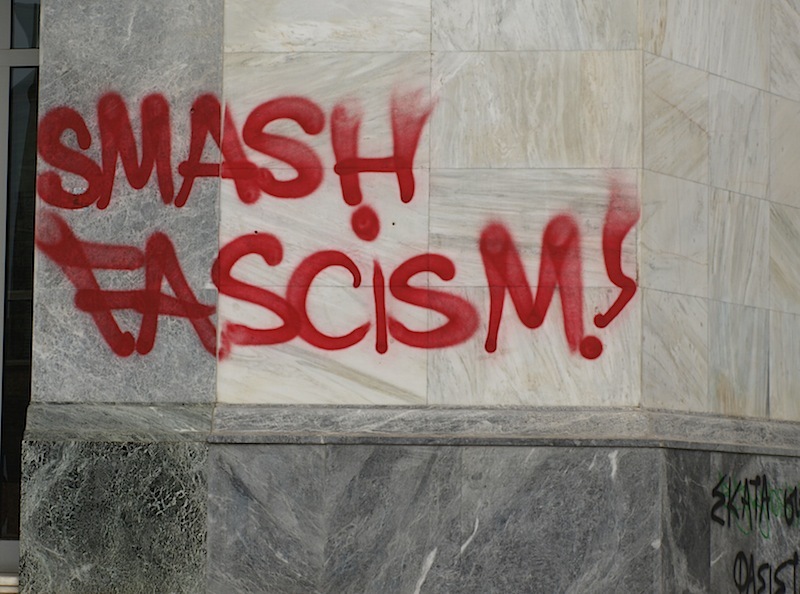 The scourge of graffiti has struck Greece. I have not seen as much anywhere in the world and that includes Sydney. Undoubtedly most of the graffiti has a political message. Unfortunately marble, from which most of the public buildings are made, makes a great contrasting surface to decorate. 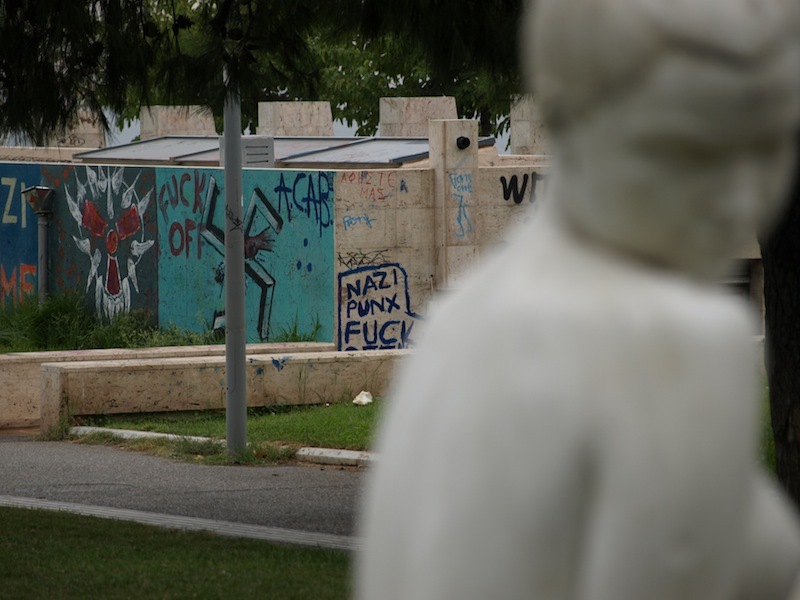 There is a lot of explicit anti Nazi messages on public buildings and monuments. The maiden in this photograph is keeping an eye on her back, hoping a graffiti artist doesn’t strike. Wouldn’t you be annoyed if this was your wall? I have to admit, though, the lettering is rather creative. Sometimes the graffiti artist can’t spell but this one got the text mixed up I think. 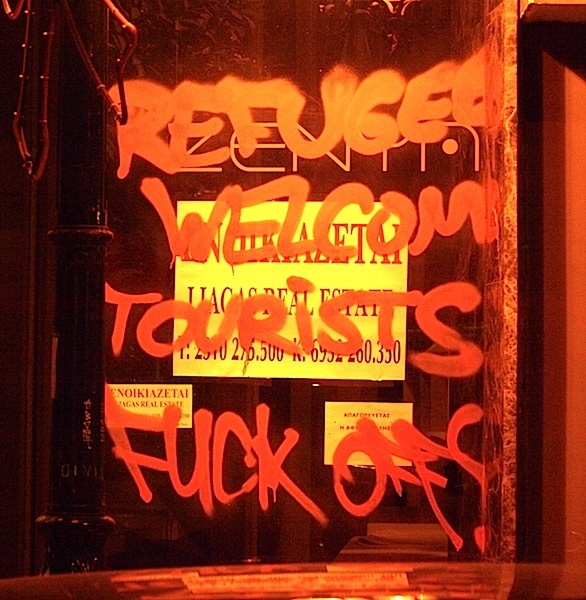 I thought tourists would be welcome as they bring hard currency to the country. Some graffiti is very arty but just the same the perpetrators of this piece of artwork has violated private property. Unless, of course, the owner of the wall granted permission to the graffiti artist. My apologies to our Thessaloniki friends about showing the less attractive side of Greek society but as a visitor the graffiti is what ‘grabs’ us. I think the graffiti is an expression of disenfranchised youth who are, I suspect, frustrated and confused as a result of the present financial crisis. Recently an expert in demographics and history said, following the recent London riots, many of the world’s youth are on the boil due to unemployment and isolation and if a new world order is not developed where the wealth of the world is shared equally there will be revolution. 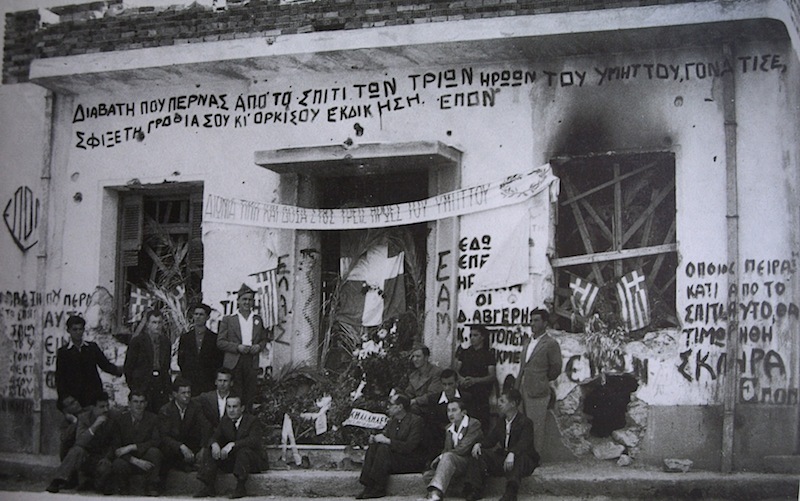 Graffiti is nothing new in Greece. The photograph shows a graffiti-strewn wall on a house just after WW2. I don’t know what the writing says. Maybe one of our Greek friends can enlighten me, I hope it’s not unsavoury. 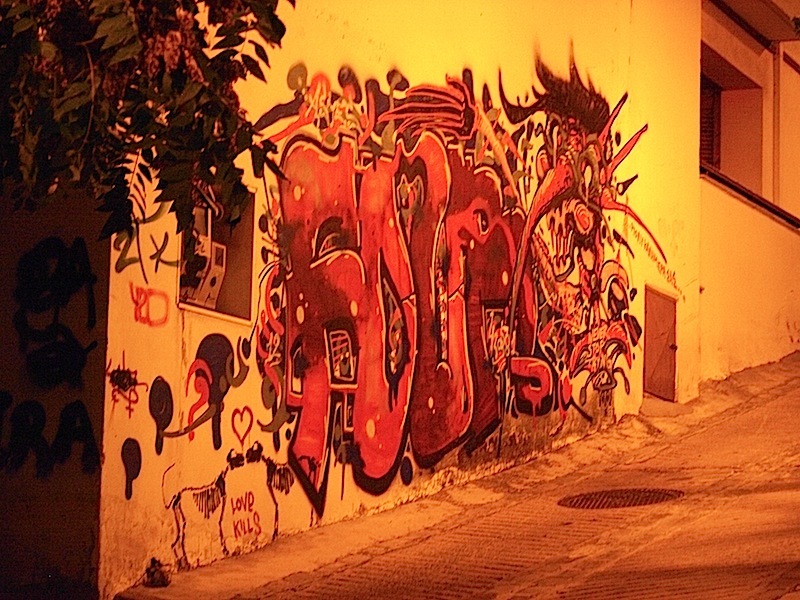 Readers, do not think that all of Thessaloniki is smothered with graffiti and disenchantment; it’s not, there are some very trendy and fashionable parts to it. For example, in a mall through the centre the fashion-conscious saunter, drink coffee and socialise. Friday and Saturday nights are the big nights out. 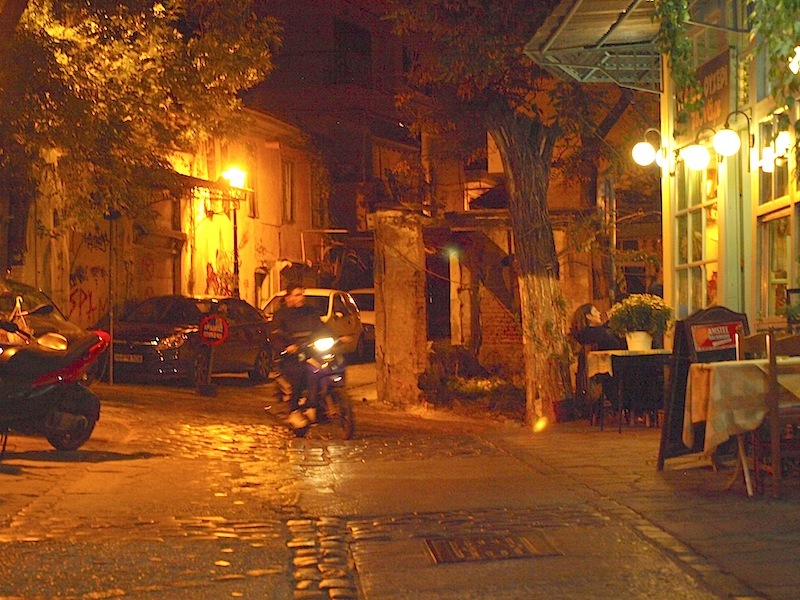 After our night walk in old Thessaloniki and to the castle ruins we came back into an area where thousands of young people sat at bars and cafes open to the street, enjoying each other’s company. An interesting point to note is that many of the young people were not drinking alcohol; most seemed to be drinking fruit juice, Coke and coffee. I thought maybe the Coke and fruit juice were laced with something but Litsa assured us not. It’s so frustrating not being able to understand what the revellers were talking about: was it politics, religion, fashion, music, celebrities or simply trivia? The new pasta restaurant Pastaggio. 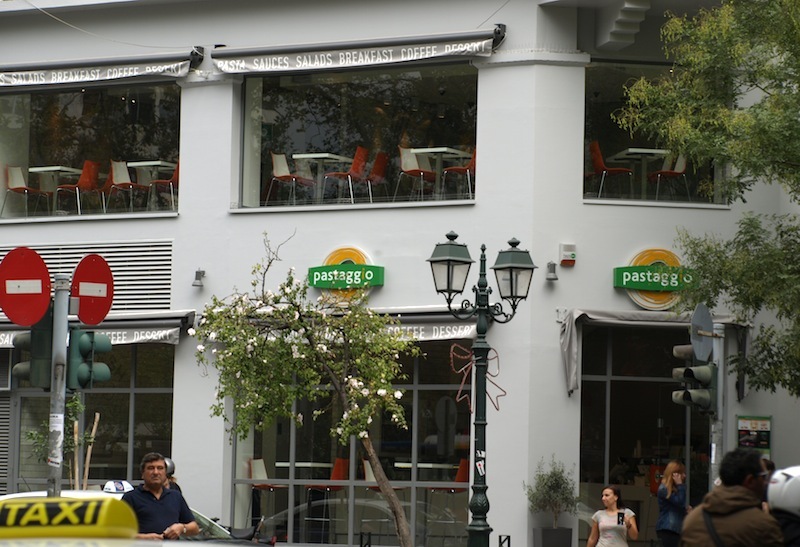 Litsa and John’s son, Dimitri, with a few friends has opened a pasta restaurant, unusual for Thessaloniki. They are trying something new. The design of the café is very modern, architect-designed. It’s two storey and is a pleasure to go into, not only for the décor but the service as well. 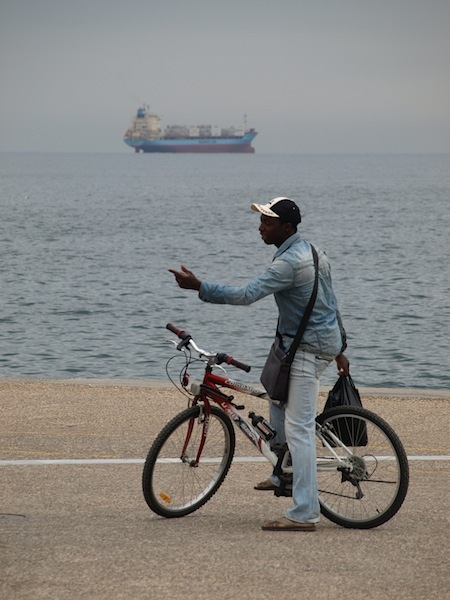 There are a lot of black Africans in Thessaloniki. Many are students and others refugees. Some are obviously short of money as they have turned to street hawking, selling all manner of goods ranging from electronic gadgetry including iPods and iPhones to leather belts, walking poles, watches and cosmetics. We learned early not to sit on the outer edge of outdoor café areas because you are too easy a target. All the hawkers have a sob story and no doubt many of the stories are true. I asked one bloke if he would ever go back to his country Senegal and he said he had no passport and he was stateless. We can’t comprehend being in a situation like that. It’s just as well Greece has a sympathetic attitude to these homeless people otherwise they would suffer even more. I gave one bloke five euros even though I didn’t take the aftershave he was flogging. He took the money graciously and then turned on his heel and shot away. I hoped he was going the share the money with his mates. A street hawker loaded with goods doing a hard sell along the boulevard. Like most ancient cities the old areas of town are found within castle walls or very close to the outside of the walls. In days when invasions by foreign powers was common, the best place to be was within castle walls or as close as possible to the garrison. 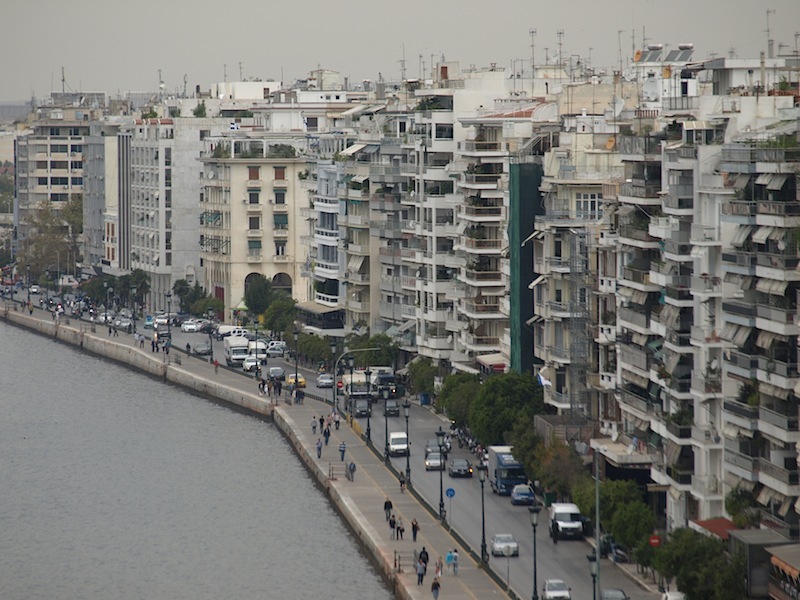 This was the case with Thessaloniki as well. 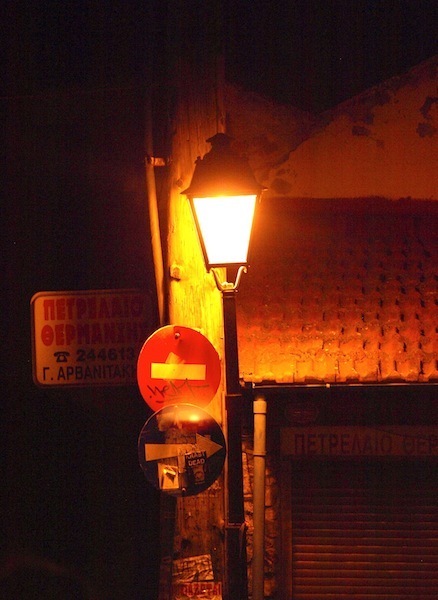 Few people take a walk into the back streets of old Thessaloniki at night but Litsa insisted we check out the nightlife. And so began the trek. By 11.30 I reckon we had done around ten kilometres and it was far from easy going as cobblestone pavements made for difficult walking. To get to the old city we had to first walk the length of a Roman hippodrome. 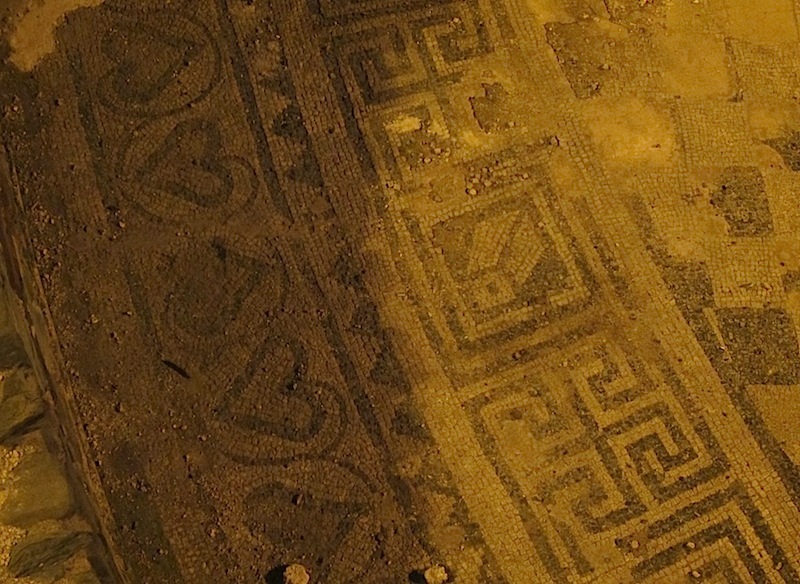 At some stage in its history it was filled with rubble and paved but now it is being excavated so the entire walk was through an archaeological dig. If you think the following images are not the best quality it’s because they were taken in the dark under difficult conditions. 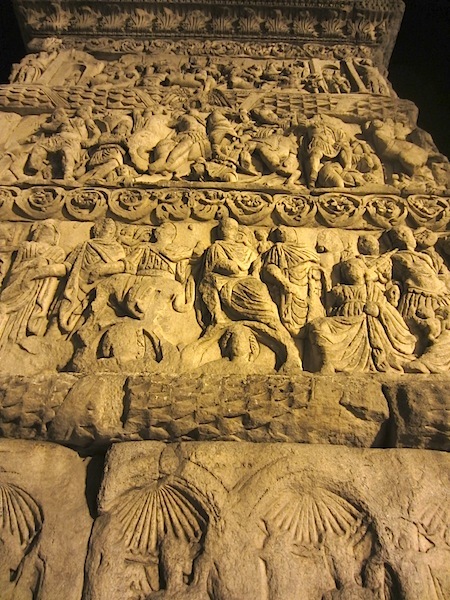 Thessaloniki’s Arch of Galerius by night. 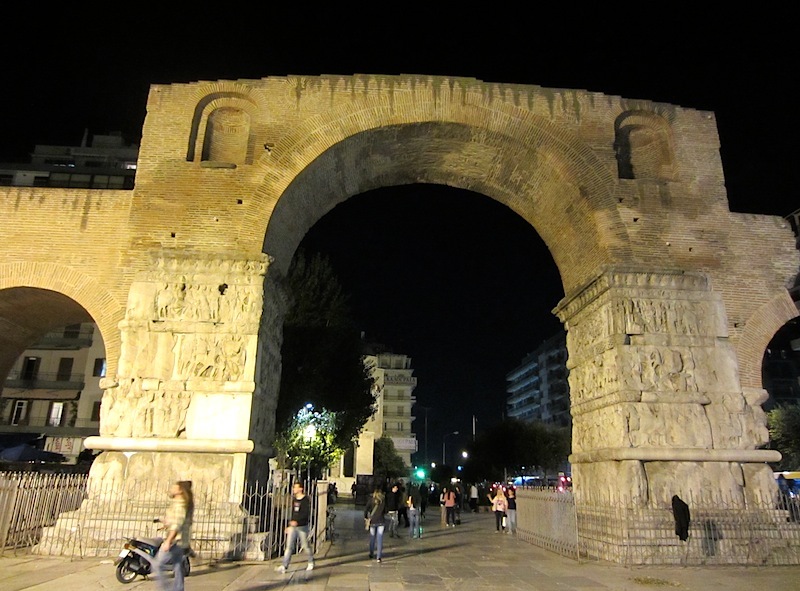 The arch above at the top of the hippodrome was built by Galerius in the 4th century. Its status has changed over the years from simply being a thoroughfare to a revered monument. Near the base of the arch images were almost indistinguishable as mechanical and wind damage had taken its toll but higher up they were quite well preserved as the above photograph shows. 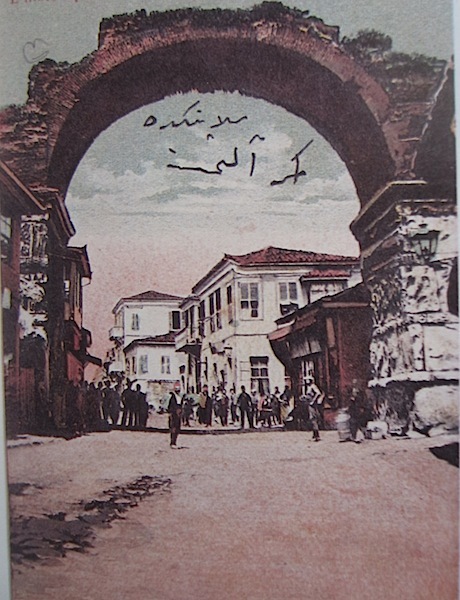 The Arch of Triumph in the days of trams and before restoration. 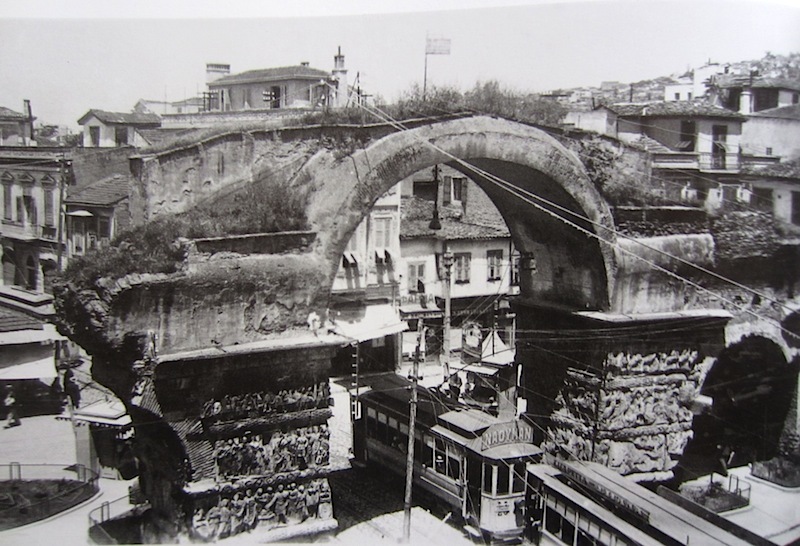 Thessaloniki’s Galerius’ Arch before the trams. From the arch we caught a taxi to the castle on the hill. Night views are always expansive and thus it was impossible to photograph it in its entirety. I concentrated on what was going on around me. The spot was obviously the local location for young lovers as there were couples doing what young lovers do, staring into each other’s eyes and cuddling. This image really is a shadow. 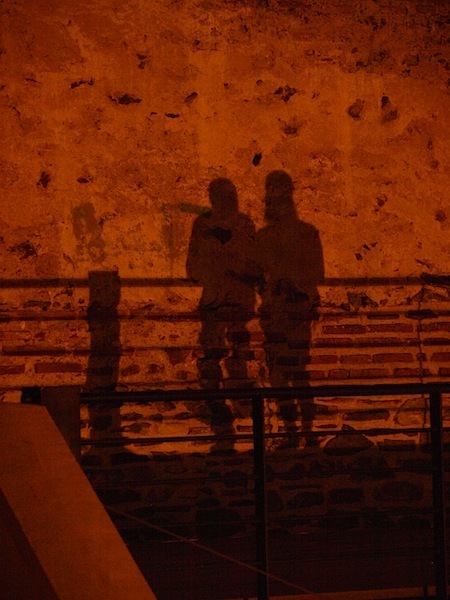 The couple creating the shadow were about 15 metres out of the frame on the right hand side. The light scource was from flood lights illuminating the castle tower. Bulwarks on southeast side of castle. It was a little difficult getting a good photograph of the walls at night so this old image will have to do. Of course the area at the base of the wall has now been developed and there is a walking path running along the side. Within the castle walls there were many restaurants, all doing a good trade. Some had live entertainment, mostly males singing what I always thought was simply Greek music but there are several styles of music and the Rembetiko style was basically what we heard tonight. In days gone by it was music of the Greeks who had been expelled from their homeland in Turkey. Rembetiko is a sort of Greek urban blues; however it was forbidden. Rembetiko slowly emerged from the underground and was played in the nightclubs of Athens, where it became very popular. The trek down from the castle through narrow twisting alleyways was surreal. Narrow, sometimes sinister-looking passageways, lead us ever downwards. I doubt if Bev and I would have ventured into the world of alley cats on our own at night. However we felt safe in Litsa’s hands. At times she seemed to be lost but she asked for directions often and even stuck her head in open windows and enquired. Cobblestone alley on the way down. One of the many guiding lights along the path. Back to earthly delights having experienced heavenly pleasures up at the castle. Returned to the apartment around midnight. John was out with his mates. Many Greek men go out around ten and meet with their friends at the local taverna, play cards, dominoes, backgammon or talk. Rarely do you see women with the men. 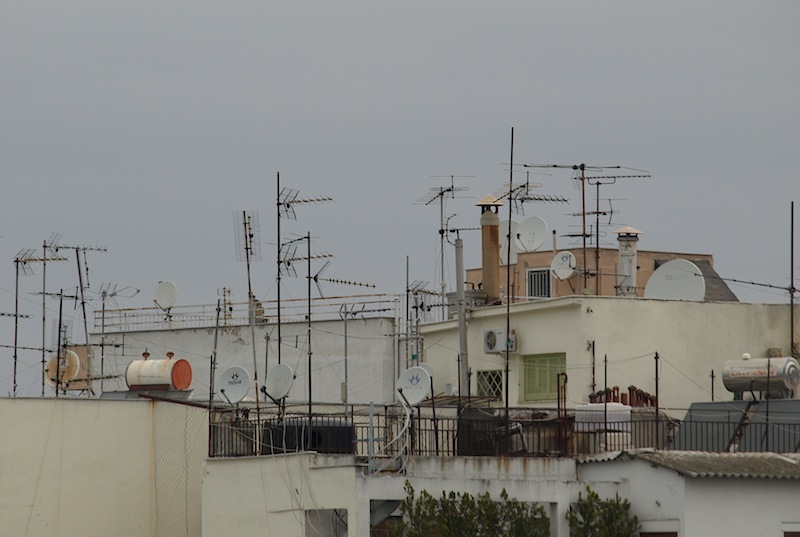 I asked Litsa what were the women doing and she reckoned they were at home watching television. Near John and Litsa’s apartment we frequented the caldo e freddo café (translated from Italian as hot and cold). When travelling with kids you know where every playground is. When travelling and writing a blog you know where every internet café is. One very innovative name for an internet café was coffee@caffe. When we find a café with good food, friendly staff and the @ connection we keep going back. It enables us to get to know the locals, the lingo and post. 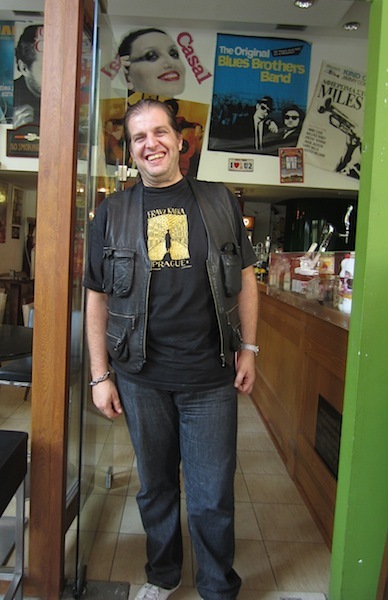 Our new friend, George, at the caldo e freddo cafe. To me, sitting in cafes for hours at a time over a single coffee or drink is a waste of time, there are usually other things to be done, but in Greece it’s a national pastime and the owners of the cafes don’t seem to mind at all. I’m not sure if there is such a classification but I think this building fits the description. The building here is the Thessaloniki Opera House and what fascinates me is the number of bricks in the building and that the bricks are smaller than the standard size. The standard size brick we know today was set by one of the Charlie Kings of England. At the time brick makers all over England were making different sized bricks, which meant non-compatibility, so the king issued a decree that all bricks were to be made the same size and any makers who didn’t conform would lose their head. This ultimatum soon standardised brick sizes in England. 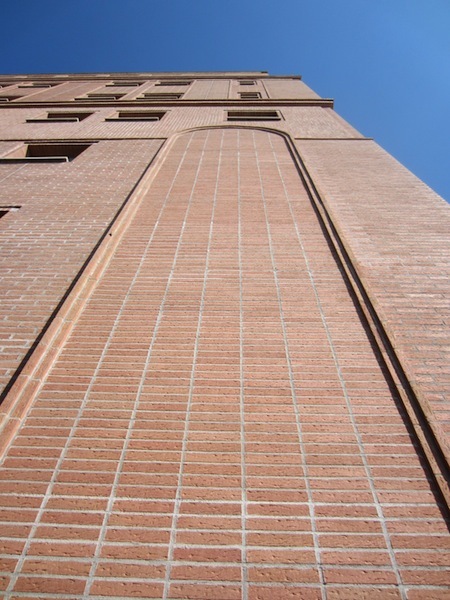 An enormous undertaking, building with bricks like this. Intricate brickwork in the walls of the opera house. 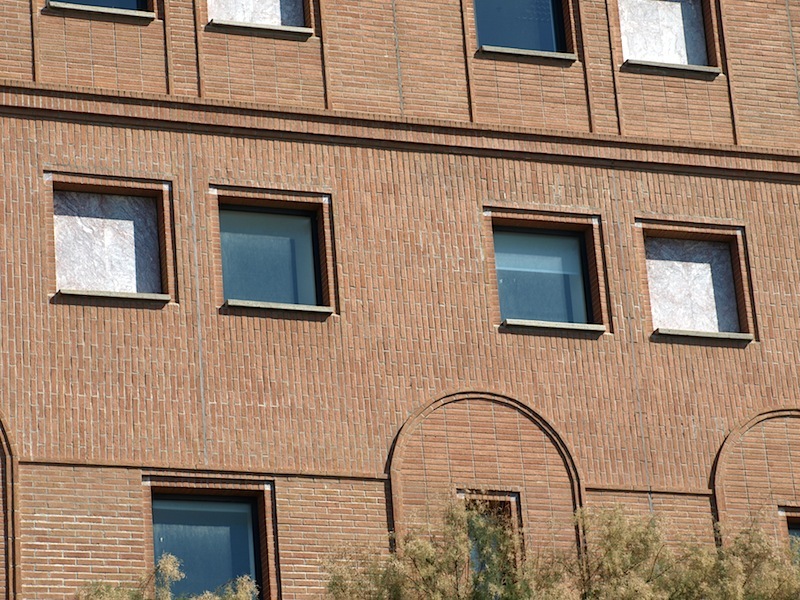 Note the use of bricks in the vertical, a most unusual and remarkable achievement to build a wall like this. There is no doubt about the Greeks, they are experts when it comes to playing with stone, bricks and mortar. From the opera house we returned to our favourite café and made plans about moving on. Our next port of call is Kalambaka to the west of Thessaloniki and from there we will head into Albania, the land of the unknown for us. In the 1970s when we were kicking about these parts Albania was under the iron hand of Hoxha (rhymes with dodger), a communist dictator. If travellers strayed into Albania by accident in those days it was said they never came out. 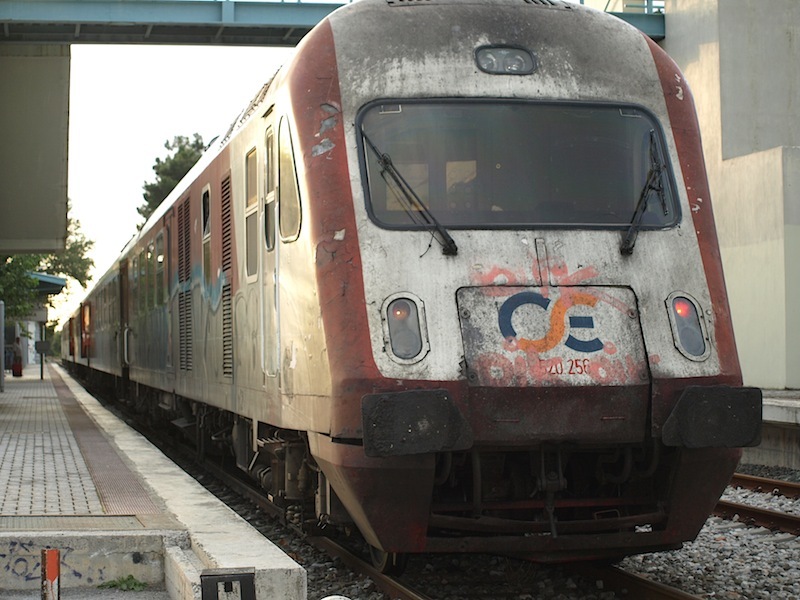 It was decided to travel to Kalambaka by train. Litsa and John have two children, Lisa and Dimitris. Dimitris is part owner and manager of the Pastaggio restaurant and Lisa is a pianist and piano teacher. Both are very articulate and proud of their heritage. We spent some hours with them, getting to know the ways of young Greek people. 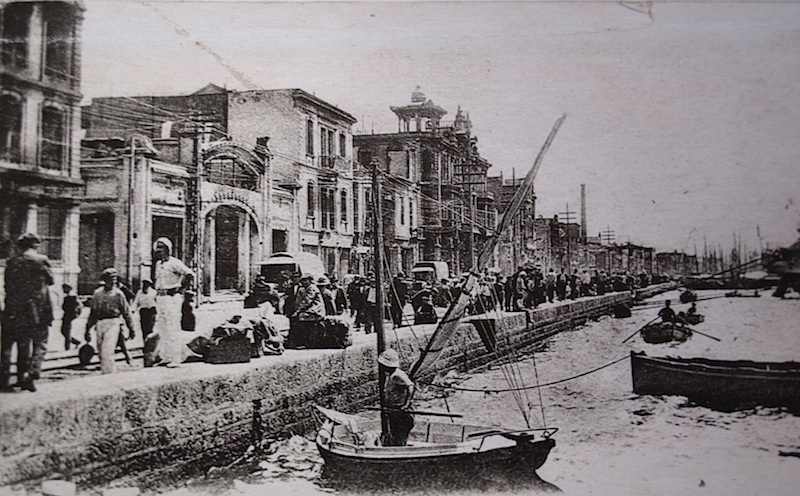 Following are a few old pictures I came across in Thessaloniki and although they do not apply to any specific text relating to Thessaloniki I thought I would share them with you because they are just so good. 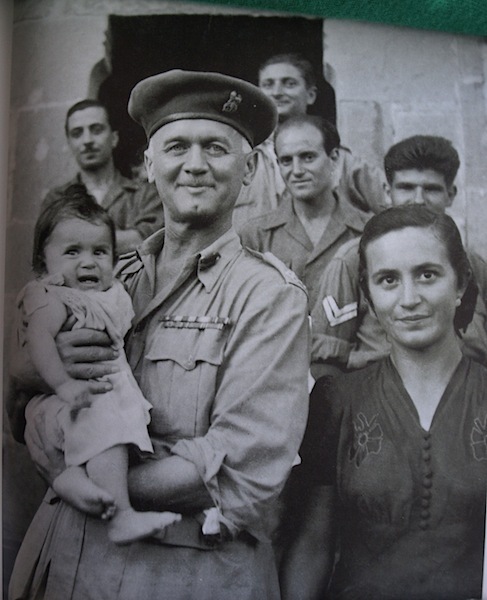 I would like to think this soldier made it through WW2 and back to his wife and baby. 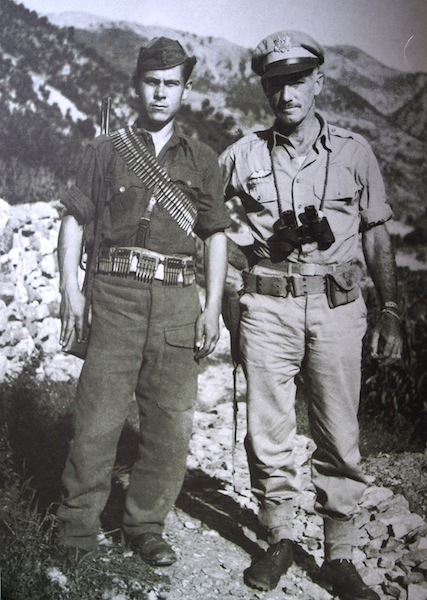 A WW2 Greek resistance fighter and a liberator? 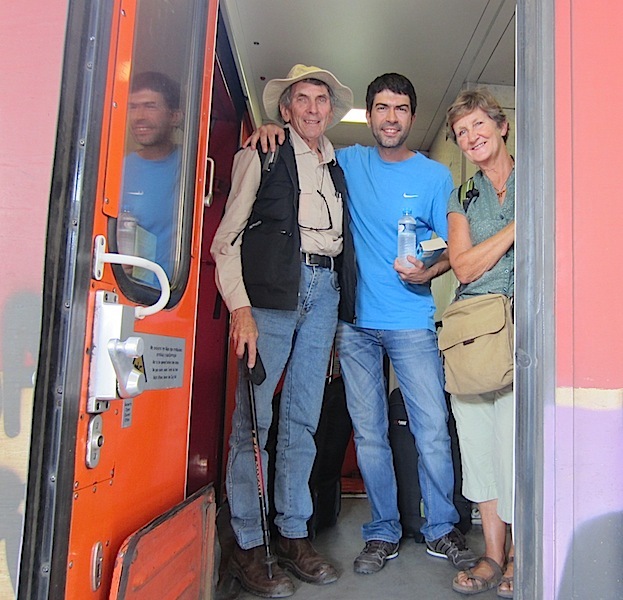 Dimitri and Litsa took us to the railway station. We really appreciated the hospitality bestowed on us by the family. 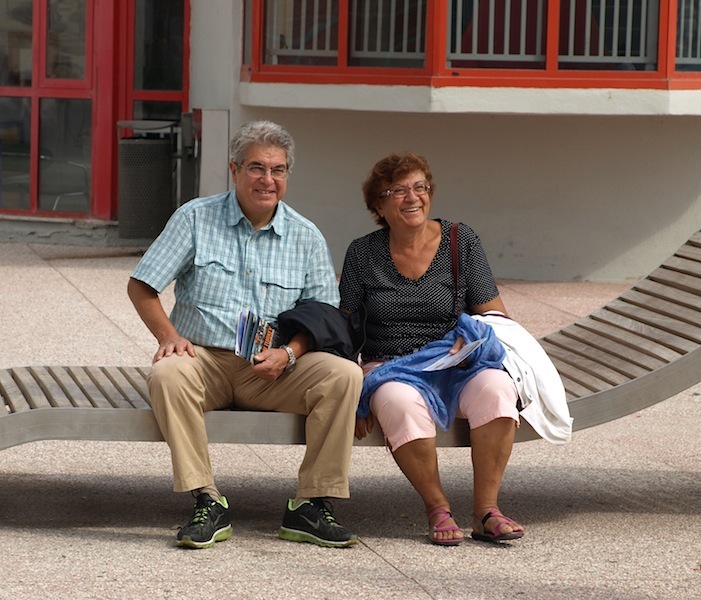 Looking at monuments and ancient ruins is satisfactory enough but what is important to us is looking into the lives of the people whose countries we visit, something we were able to do when staying with John and Litsa. This photograph was taken just after lunch on the day we left. You might ask how come he was in his pyjamas. 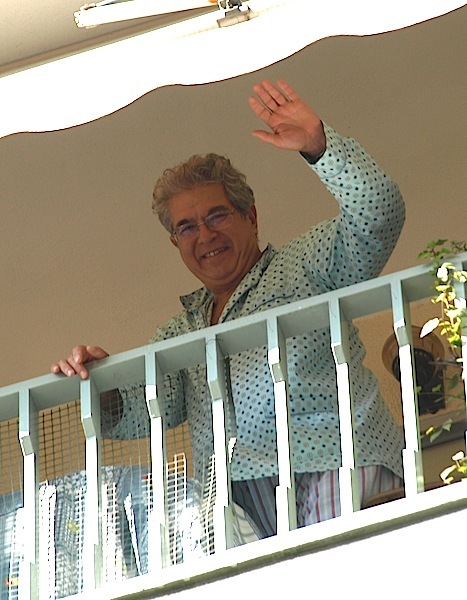 The Greeks, as you probably know, have a siesta after lunch and John takes his seriously! You’ve also probably heard of ‘lounging pyjamas’, a fashion for women in the 1930s. John is keeping the ‘lounging pyjamas’ era alive! Final farewell. Dimitri about to leave us after making sure we found our seats on the train. The train left close enough on time. Problem was we had a window column so couldn’t see out so well. It’s not easy booking train and bus tickets and stipulating where you want to sit when you don’t speak the language. You have to take pot luck. It turned out not to be a problem as there were a number of passengers leaving the train at stations along the way so I simply kept changing seats. The journey took about three and a half hours and cost $33 for the two of us. Our diesel train. Don’t be put off by its appearance. It was super comfortable and travelled at a good pace. 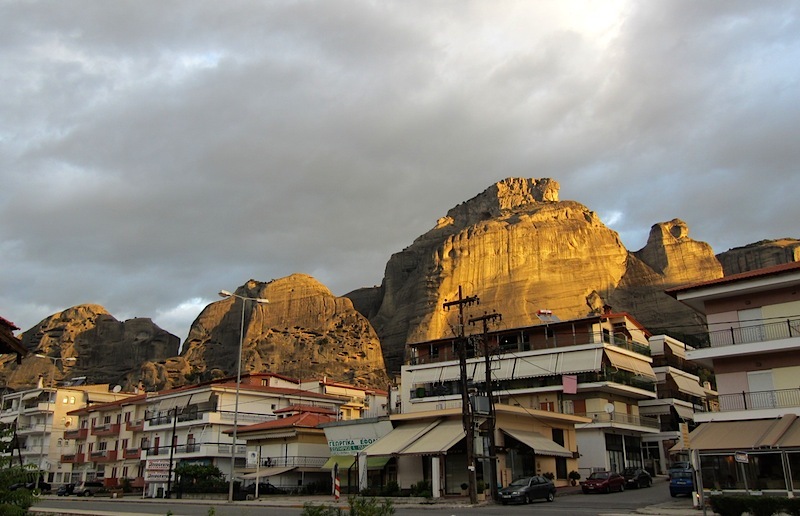 Tomorrow we head into the World Heritage area of Meteora where monasteries perch on top of gigantic boulders. By the look of the mountain silhouettes in the moonlight from the hotel balcony we are going to be in the region for a few days. Mountains behind Kalambaka. Our hotel is in behind these shops. Photograph taken from railway station.